Loving Life with Little Ones: Little 3 at 16 months old. Little 3 has reached the grand old age of 16 months, it is hard to believe how small he was just a few months ago. He has definitely left babyhood far behind and is a fully fledged toddler now. The past month has seen many changes in him. Having learnt to walk at 13 months Little 3 has totally mastered that skill and is now running everywhere, he spends a large part of the day trying to spin around in circles until he is dizzy and loves to kick a little ball around, he is also beginning attempts at jumping (bouncing on his toes with bent knees so far). His physical development has come on leaps and bounds although he seems to have had a bit of a growth spurt. Having got a bit taller he has gotten really unsteady on his feet recently and that ended up with us in A&E the week before last with a rather nasty head bump when he lost his balance and hit his head on the corner of the living room wall. He has also begun climbing more, luckily not out of his cot yet, but he moves things around and stands on them to reach up, a number of times I have found him pleased as punch because he has reached something his sisters have left out of reach (or so they thought) and once or twice I have caught him try to get food in the kitchen, the monkey! Little 3's co-ordination and fine motor skills are coming on a treat, he loves to get out the threading cards on a daily basis and tries as hard as he can to get the laces through the holes although he has only managed it with help so far, he also likes to thread the laces through anything and tie up random objects so I am finding laces everywhere. He currently loves painting, drawing and colouring and is really pleased with himself as he sees the marks appearing on the paper or water mat, he sits so nicely with concentration etched all over his face as he dips the brush in the water pot or puts a lid on a pen, but he does still put things in his mouth so I have to keep a close eye on him. Little 3 is a marvel with his cutlery skills and will sit with a spoon and fork using both very well and rarely uses his hands now. 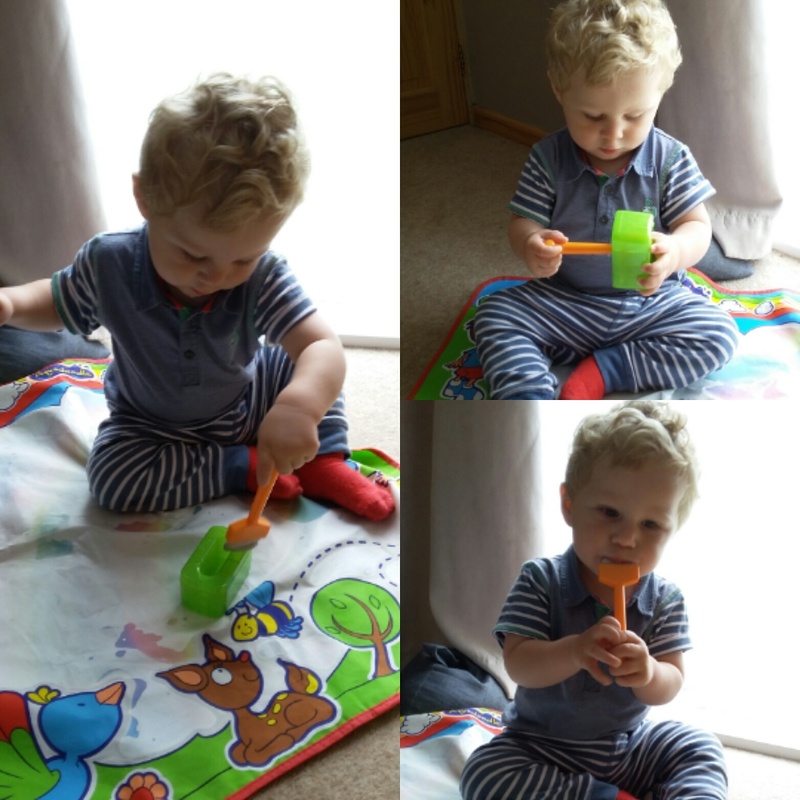 He particularly likes to try and pick up his peas (a favourite food) with his fork and will persevere with this for ages, it helpfully keeps him amused for quite some time at mealtimes. 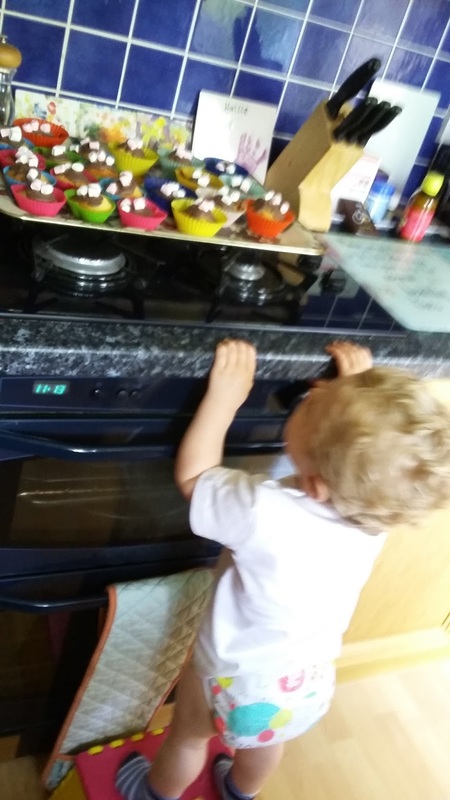 He doesn't like you to help him and will get quite cross if we try but he will let us help him to hold his cutlery in a better way so he has more success. 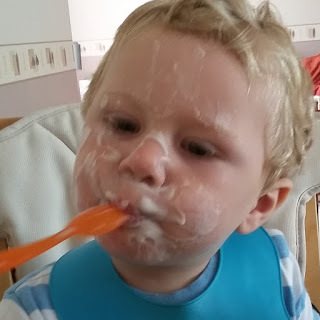 Although he is a dab hand with his utensils he is still only young and finds yoghurt and those fruit puree pots particularly challenging where he will usually get frustrated and dive in with his fingers, he quite likes to wear them too. 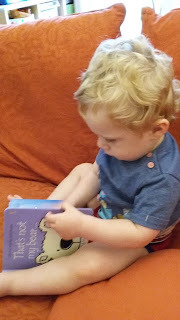 Little 3 also loves books at the moment too. He is always pointing to the books we have and saying 'book', he will climb up on the sofa with one by himself or reverse himself onto my lap for me to read to him and it is the first thing he asks for after his nap. He doesn't mind what we read but he enjoys books with flaps the most. 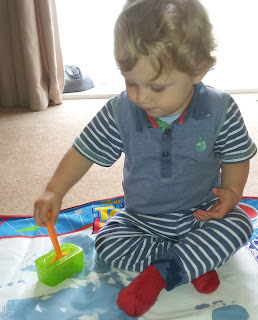 Little 3 has also had a big development in the way that he plays, before he would flit from one thing to another for a few minutes at a time or bash things but now he seems to have taken in what to do with his toys. I have been watching him play and he now pushes his cars along the floor making engine noises or makes the little Happyland people walk up the stairs and things like that. I set up the train set the other day and we played together for absolutely ages, it was fascinating watching him trying to work things out, fit the bits together and put the trains onto the track. He liked whooshing the trains over the bridge and spent a long time doing this. 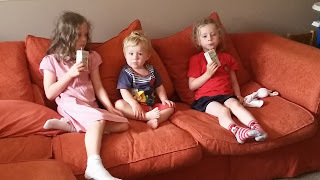 Now that Little 3 is a bit more grown up he is just like one of the gang and not 'the baby' anymore, his level of language (he currently speaks around 30 words although some of them are partial still) and understanding means he can play with the girls. He can get the idea of their simple games and follow directions as the girls build towers for him to knock down, play with the cars together or just kick a ball around the garden. He will go and sit with them for a snack or curl up on the sofa and watch a few minutes of television with them after school. 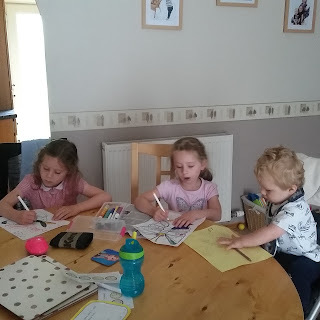 It has been great of late to see the three of them playing together and I look forward to watching them develop as a trio over the summer holidays. He is also such a cutie, curly dark blonde hair with a cheeky smile, my boy at 16 months.